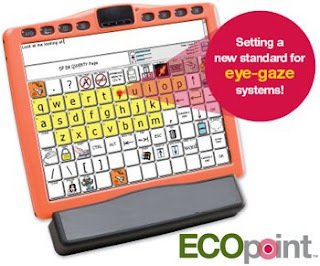 PRC's new ECO-14 has an option for their new eye-gaze system called ECOpoint. The ECO-14 is a large screened, touch enabled AAC device running on a Windows XP machine (available closed for those using Medicaid for funding). It comes in a few (4) colors and now has the new ECOpoint eye tracking avaliable in addition to the built in head tracking it has had for some time. All PRC systems use the Unity (Minspeak) language system. ECOPoint adds $7250.00 to the price of the device, which is pretty standard in the scheme of eye gaze systems these days. The ECO-14 itself costs $7795.00. Once you add in warrenties, mounting systems and other items, like switches and carrying cases, you are looking at $16 to 18,000.00 for a full system. Also fairly typical for cost wise for an individual who needs a device capable of eye gaze. PRC is also currently hosting a giveaway contest for the new device.